A model walks the runway at the Lucio Vanotti show during Milan Fashion Week Fall/Winter 2018/19 on Feb. 21, 2018, in Milan, Italy. Milan Fashion Week got underway Wednesday with a moment's pause to put focus on women who have come forward as victims of sexual misconduct. Ambra Battilana Gutierrez, who accused Harvey Weinstein of groping her in 2015 and worked with investigators on a sting targeting the producer, walked the runway for Rocco Barocco. She told reporters afterward, "Finally something positive. I am happy to be returning to my craft." 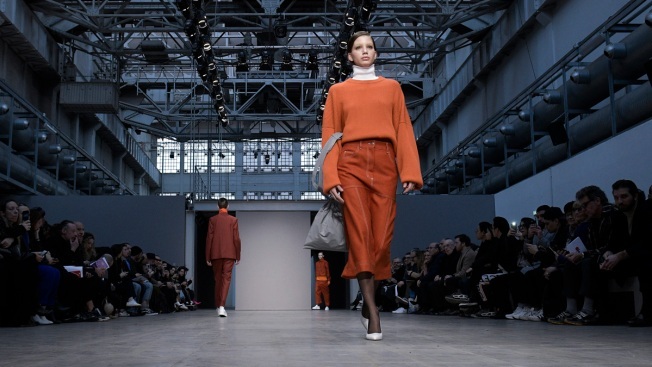 The Humans of Fashion Foundation non-governmental organization was also in Milan, where it plans to launch its global initiative connecting people in the fashion industry who have experienced sexual harassment or assault with a support network, including legal and emotional. Alessandro Michele fully covers his models from the top of elaborate headpieces to the tips of their bejeweled toes in a seeming effort to hide the person in order to reveal a character. And there was a full range of new characters in his show combing menswear and womenswear for the next cold weather season. The cast included a masked Inuit in a furry lined jacket, a Renaissance woman in a long velvet dress, Victorian characters in layers of pleats, a blue turbaned man in tan leisure suit, and Middle Eastern woman in beaded head covers and long, flowered robes. Backstage, the creative director said he wanted to explore "the codes that constrain us." "All of this I robbed from others, in the sense that I imagined in the passe partout of the codes that ranged from the bourgeois to the thing that I put on in the morning to go to the bank, or all the suits that my father bought to go to work for Alitalia," Michele said. Michele set the show in a mock operating room, complete with (unused) surgical tables and overhead lamps. The reference, he said, was to the surgical precision with which he approaches his craft. In a spookier surgical/Frankenstein reference, two models carried replicas of their own heads in their hands. So it was perhaps a warm, fuzzy moment when a man in a long black skirt and jacket covered with crystals, carried a pet dragon, of plastic. While some fashion houses really do design airline uniforms, Jeremy Scott created a retro-futuristic array of looks for an alien starship crew. Models sporting Jackie Kennedy-style bobs strutted through Star Trek blue-lit gangways, wearing bright colors of the same assortment found in the non-edible box of sugar candies that came with the Moschino invitation. For the alien affect, some had blue-, or orange-, or green-colored skin — all very Deep Space Nine. The silhouette stuck to clean lines of 1960s women's suits or uniforms, with neat zippers down one side, or dark patent leather trim, or reverse pleats. Skirts were mini and worn with matching color pumps. Pants were long and trim, elongated even more by vertical stripes. Headwear included stewardess caps or berets. And the real accessories of the season were a series of detachable collars, including a black patent leather with a pointy collar and rounded back. Other Moschino touches: peace sign earrings, clear colored plastic belts with the brand name spelled out in hanging letters and Crazy Fruit candy backpacks and pyramid-shaped clutches. The collection closed with a series of evening dresses, including mermaid skirt in a shimmery purple contrasting with silk chiffon. The elegance of down-filled winter wear came through in a Moncler collection put in the hands of eight diverse designers, from Valentino's Pier Paolo Piccioli to Francesco Ragazzi of his Palm Angels streetwear brand. The collection, dubbed Moncler Genius, was unveiled in a series of pavilions each draped in a silvery fabric cast with shimmering lights. Visitors, including supermodel Naomi Campbell, wandered between each designer's world. Piccioli created long graceful down couture gowns -- nominally the Moncler puffer coat -- that in their conical shape gave the impression of a forest, in stands of white, black and layered colors. The longer pieces, which sloped gracefully to the ground, were over-laid with vests or cropped jackets. Each finished in a snug-fitting hood. Simon Rocha's collection was shown against a mountain backdrop, with Geisha-sherpa models in traditional robes or Victorian-inspired layered black dresses walking deliberately through a snowy landscape. Kei Ninomiya created elegant evening dresses out of Moncler nylon that was alternatively appeared as big weaves or pretty florets, the black patina picking up just enough light to give a shimmer effect. The idea behind Genius is to offer new products continually to consumers with the aim of appealing to diverse consumers. The first collection, by Hiroshi Fujiwara's brand Fragment will be available in June. The looks include down-filled flannel shirts, sea blue and green Nordic-style sweaters and down parkas for the world traveler emblazoned with the cardinal compass points.